In the following discussion, I assume a nonluminous object under a microscope being illuminated from behind (transmitted illumination). I discuss a few important issues related to Köhler illumination and critical illumination. This microscope illumination is also known as Nelsonian or "source-focused" illumination. It was first developed by British microscopist Edward Milles Nelson (1851 – 1938). A uniformly bright light source, which could be given by an illuminated frosted glass, is placed close behind the field stop. The condenser images points of this light source on to the object plane of the microscope objective (location of specimen). Historically, the flame of an oil or gas lamp was projected via a silver coated mirror into the condenser. Of course, in this case, the bright light source is not close behind the field stop but a few inches apart. These natural light sources provide an essentially structure-less source of illumination. With the introduction of electric lighting using lamp filaments, critical illumination without the additionally added frosted glass was rendered less suitable. Many implementations of critical illumination exist. Most lower cost microscopes use some sort of critical illumination. However, if no condenser is used, no image of the light source can be projected into the specimen plane. An illumination that does not form an image of the source somewhere inside the optical path of the microscope is known as afocal or nonfocused illumination. August Köhler described this type of illumination in 1893 . A converging lens (usually referred to as Köhler lens) is placed close to the field stop to form an image of the source in the front focal plane of the condenser. In most microscopes, the so called Köhler lens is replaced by a collector inside the lamp housing and a field lens close to the field stop (see Fig. 1). The rays from each source point then emerge from the condenser as a parallel beam of light. This arrangement has the advantage that any irregularities in the brightness distribution of the source do not cause unevenness in the field illumination. In summary, Köhler illumination has the following main advantages. First, it provides an even illumination in the specimen plane and all its conjugate planes. 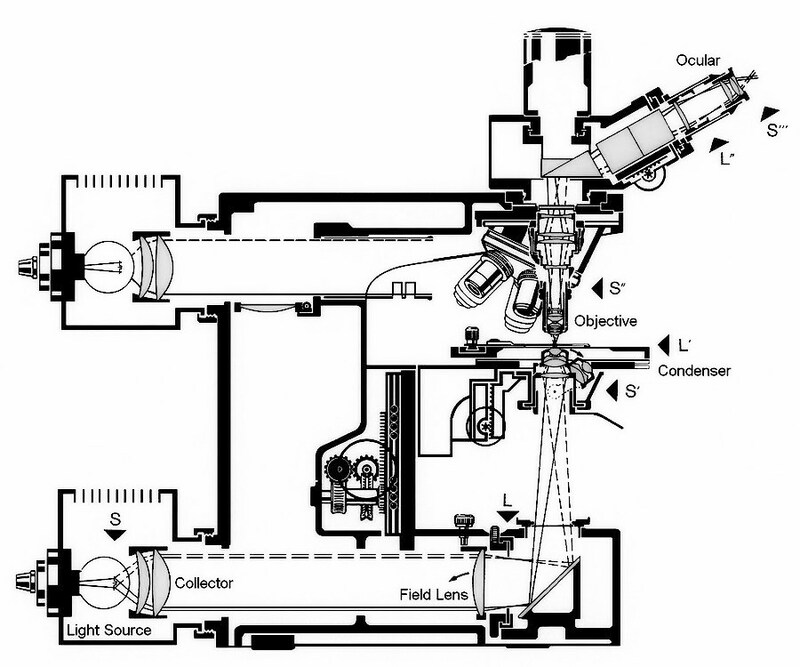 Second, this type of illumination positions two different sets of conjugate focal planes (conjugate object planes and conjugate aperture planes) at specific locations along the optic axis of the microscope. 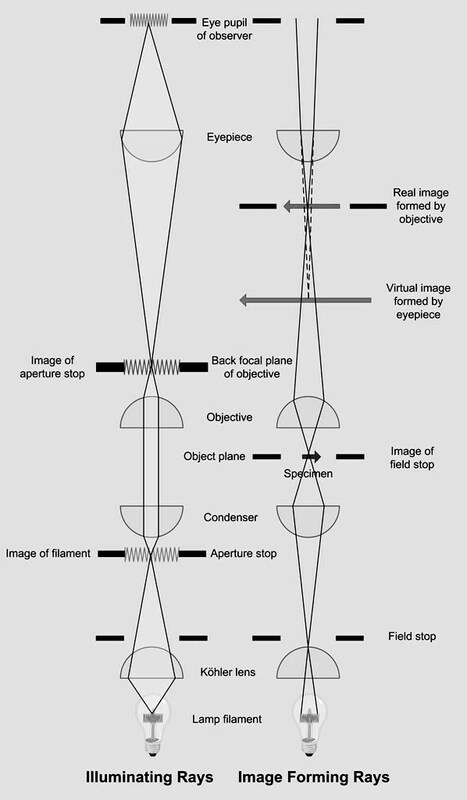 Conjugate object planes: field (or lamp) diaphragm, object (or specimen) plane, real intermediate image plane (located at the eyepiece field stop), retina or camera sensor. Conjugate aperture planes: lamp filament, front aperture of condenser (location of condenser diaphragm), back focal plane of objective, exit pupil of eyepiece (location of the pupil of the observer's eye). A diagram showing the conjugate aperture and object planes for the Köhler illumination is provided in Fig. 2. It is important to note that many microscopes do not support true Köhler illumination but a modified version of this type of illumination. In this modification, a diffusing plate is placed in front of the source and the lamp lens focuses the surface of the diffusing plate in the first focal plane of the condenser . In other designs, such as the 6V/30W illuminator of the Leitz Ortholux (see Fig. 3) or in some 12V/100W illuminators of the Leitz Orthoplan (see Fig. 4), the collector lens located inside the lamp housing is slightly frosted in order to distribute light more uniformly. Last but not least, we commonly find a frosted glass (a.k.a. ground glass) just following the collector lens (when seen from the source), as implemented for the 12V/50W lamp housing for the Leitz Ortholux II (see Fig. 6). To establish Köhler illumination, this frosted glass will be removed before focusing an image of the filament into the back focal plane of the objective (see Fig. 2 for the location of the back focal plane of the objective). After completing the process of establishing Köhler illumination, the frosted glass is reinserted. In case of a frosted collector lens, the diffuse image of the filament must be projected into the back focal plane of the objective. 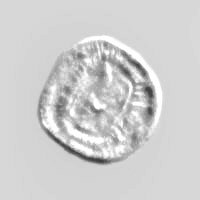 - The proper procedure to establish Köhler illumination is illustrated in many textbooks about microscopy or photomicrography. One of the best illustrated descriptions on how to properly setup Köhler illumination has been published by J.G. Delly . With Köhler illumination, the illumination source is perfectly focused into the front focal plane of the condenser and each of its conjugate aperture planes. This requires that the illumination source is sufficiently planar, which is not the case for any type of arc lamp and incandescent light sources. Consequently, only light from a central plane of the illumination is correctly focused into the front focal plan of the condenser (location of the aperture stop). Light emerging from outside the central plane will not be “perfectly” focused at any conjugate aperture plane. This deficiency of true Köhler illumination leads to some level of uneven illumination inside the specimen plane. Highly corrected condensers, such as the aplanatic-achromatic condensers, do not further contribute to the effect of uneven illumination. However, the differences in evenness of illumination caused by various degrees of optical corrections of the condenser system are very subtle and not easily measured due to the more serious issue with the non-planar shape of the illumination source. 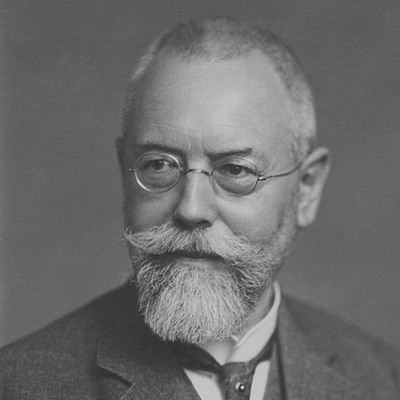 Using an illuminated ground glass can provide a more planar illumination source and consequently lead to more even illumination than any implementation of true Köhler is able to provide. At low to medium magnifications, I observed that any type of modified Köhler illumination will slightly improve the evenness of the illumination. - With the introduction of LED’s, new challenges had to be solved. Nikon introduced a special fly-eye lens in front of a single, high performance LED to compensate for any unevenness in illumination caused by the very different geometry of an LED. Whether such a fly-eye lens is required or a simple frosted glass would suffice is debatable. Comments to the author are welcomed. A. Köhler, Ein neues Beleuchtungsverfahren für mikrophotographische Zwecke. Zeitschrift für wissenschaftliche Mikroskopie und für Mikroskopische Technik 10 (4): 433–440 (1893). Charles P. Shillaber, Photomicrography in Theory and Practice, Illumination by Method III, p. 96, 3rd edition, John Wiley & Sons, Inc., New York (1947). J.G. Delly, Photography through the Microscope, 9th edition, 2nd printing, Eastman Kodak Company, Rochester (1988). First published in the December 2017 edition of Micscape Magazine.